The Bruins haven't had trouble scoring, but they're giving up more than 70 points per game to lesser opponents and are running out of time before conference play starts. UCLA basketball coach Steve Alford started off his Friday teleconference with an anecdote that sounded more like the plot to the movie "Good Will Hunting" than the plot to the 2013-14 Bruins’ season. "My first job at Manchester College, the custodian wrote a real simple formula on the board: Put the ball on one end and keep the ball out of the other end," Alford said. "It’s a pretty simple philosophy when it comes to basketball." If Alford’s philosophy is so simplistic, then why have the Bruins played such poor second-half defense this season? That reason is a little more complicated. 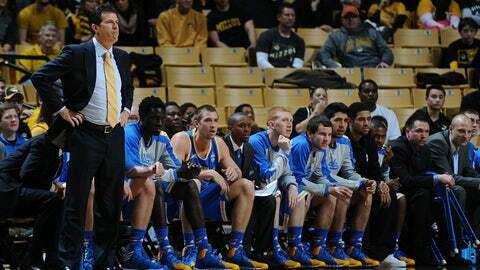 "Sometimes we over-teach and over-coach and overdo things," Alford said. "It’s really about the emphasis of a few things we need to take away: The scouting report and creating an identity." The Bruins have played a light non-conference schedule, but they have yet to become the tough, defensive-minded team Alford has envisioned. The Bruins have scored — their 86.4 points per game is second in the Pac-12 — but they are giving up more than 70 points per game to lesser opponents, and with just one non-conference game left the team is running out of time to fix the problems. "We’re farther along offensively than defensively and the defense just needs to catch up," Alford said. "The philosophy is fairly simple, it’s really just creating that identity of being consistent of how you go about getting consistent defensive stops." Alford feels the team is lacking that one key stopper, but Norman Powell is the closest to being able to play that role on the most regular basis. He’s looking for a few more to step up and finds himself implementing more man-to-man defense as the veterans have a strong working knowledge and background in the system coming off of the Ben Howland years. But that lack of a power defender and the overall defensive inconsistencies has been especially exposed in the second halves. Only two marquee teams were on the Bruins’ non-conference schedule, Missouri and Duke, and both outscored UCLA by 17 points in the second half. When the game gets away from the Bruins, it has become difficult to keep up defensively. My first job at Manchester College, the custodian wrote a real simple formula on the board: Put the ball on one end and keep the ball out of the other end. Alford is hoping that a good performance against Alabama and the eight-day break between the Crimson Tide and the Pac-12 opener against USC will be a big stepping stone in the development in the Bruins’ defensive game. "This break that we’re in now through the USC game, that’s the most practice time that we’re going to get through the rest of the year," Alford said. "This is a really pivotal two weeks here really working on things that we need to work on."